A meeting aimed at healing mistrust between the black community and police in St Louis descended into a brawl Wednesday evening, underlining the tension that is still simmering in the area since the fatal shooting of an unarmed black teenager in August. Ferguson Police officer Darren Wilson shot dead 18-year-old Michael Brown on August 9, sparking months of protests. Protesters say that the incident is one of many across the state and the country, which show that blacks and other minorities are mistreated by the police. The meeting Wednesday at St Louis City Hall was meant to provide public comment for how and why a civilian review board should provide police oversight. But the meeting broke up early when people started shouting and pushing each other. Many in the crowd got angry with comments made by police officers opposed to the review board, while one police union official was seen wearing a wristband supporting Officer Wilson, according to people who were there. 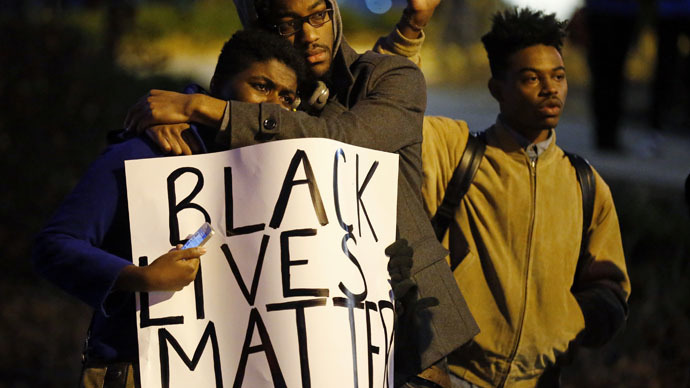 “It seemed like he was intentionally trying to provoke people,” Rasheen Aldridge, a member of a citizen’s commission to examine racial tensions in Fergusson, and who was at the meeting, told Reuters. "The tension is going to continue until we are going to get some change. People want to believe that things have settled down but with all these people still in positions of power we can't move forward with the healing process. The knife is still in our back," said Jerryl Christmas, a defense attorney who has been representing some people protesting Brown's shooting but was not at the meeting, told Reuters. Since the shooting and despite widespread and persistent public protest, the St Louis County Prosecutor Bob McCulloch refused to file charges against Wilson and a grand jury also declined to indict him, leading many in the community to conclude that there are double standards for those in positions of power.